Recently Caroline from Unfancy , shared a post on Instagram that really struck me. I.e. worrying that others will judge her for something that she truly finds enjoyment in. I resonate so much with her sentiment. I struggle with this every time I sit at my computer to write. Can I be viewed as a serious person when my blog centers mainly on style? Do people think I’m silly for choosing ethical fashion as my “hill”? But like Caroline, I enjoy style… I enjoy pursuing a sustainable closet. I also enjoy politics, theology and philosophy, literature, superhero movies, nature and outdoor activity, running and a lot more. I’m getting to a point where I don’t feel like I have to prove anything to anyone. Why do we feel like we can’t be both? I don’t know. BUT, I’m no longer going to feel bad for holding an interest in something that may seem “silly” to some people. Style makes me happy. Playing with clothing makes me happy. Makeup makes me happy… and so do a whole host of other things. SO. 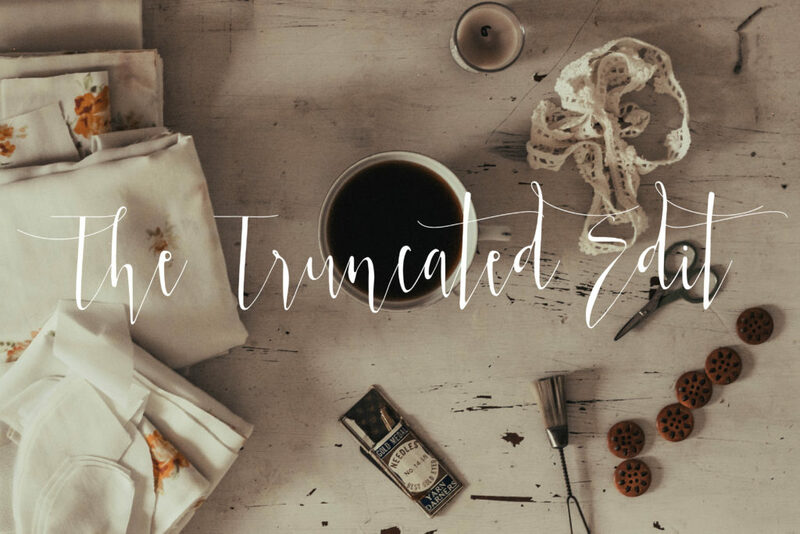 I thought I would dedicate this week’s Truncated Edit to things that make me happy. Let’s have fun with this one yeah? :: This BAGGU reusable shopper. I bought this to use as a beach bag when we were in Florida, but I’ve used it SO much since then. It packs down so well, and it fits a ton. Plus, the gingham print makes me especially happy. :: This tee from Tradlands. These cost more than your average t-shirt, I know. BUT it’s 100% worth it (if you can afford it), in my opinion. I have never found a t-shirt that fits more beautifully. The drape is gorgeous, it has some weight to it, and the sleeve and collar fit at just the right places. They are currently on sale for 20% off, but you can always get 15% off using code KARIN15 (for new customers only). P.S. it runs true to size. :: Making skirts! I’ve been using this tutorial, and turning old linens into the most gorgeous skirts ever. I just did one using an old linen, gingham (more gingham!) tablecloth I found at Savers. I’ve been sewing them a little long so I can wear them once it gets cold… Can’t wait to wear them with sweaters, leggings, and boots! :: This fall style post from my friend Andrea: so much good, fall inspiration to be found! She inspired me to put some sort of fall look book together so stay tuned for that. :: Watching uber romantic BBC versions of Jane Austen’s novels (especially this one). Sigh. There’s something about cooler weather that makes me want to watch and read classic romance. :: Drinking smoothies. Current favorite recipe: 1/2 cup frozen banana, 1/2 cup wild blueberries, 1 cup almond milk, and 1 scoop of this protein powder (first plant based protein powder I’ve found that doesn’t taste chalky! Yay!). :: Saving fish by bringing my own straws (this set comes with a travel case), and eating less sushy. Small, but important steps people! So there you have it! What about you? What makes you happy? Last week’s Edit can be found here. Kids shows are my guilty pleasure. And I don’t even have kids to use as an excuse! The ones I like usually make me feel hopeful, invigorated, and I love the deeper meanings/messages in them. Agreed! I’m always torn between Emma and Persuasion, but Persuasion wins for being the most romantic hands down! * The first hints of fall on the breeze and in actually fresh, chilly air in the morning…heaven! I am so pumped that it’s nearly sweater season. * I’m reading “A Path with Heart,” which is a book on spirituality in American life. It’s from an American Buddhist view and with a focus on meditation, but the author does a wonderful job of weaving explanations/stories from multiple religions in. I just love its positive and affirming tone. * Pour-over coffee! I recently ditched my Keurig to reduce waste and bought an affordable little pour-over unit to replace it, and the coffee is so good! * I love, love, love taking care of my house plants. Thanks Meg! What a good list!